You have to be quick and stealthy to catch the harbor royalty at this. Though they do make lovable toys, people who swim and fish are often not enchanted with them. ©2018 John Gilmore. All rights reserved. Drum track from Mauro Battisti's amazing Drumgenius app, used with his permission. 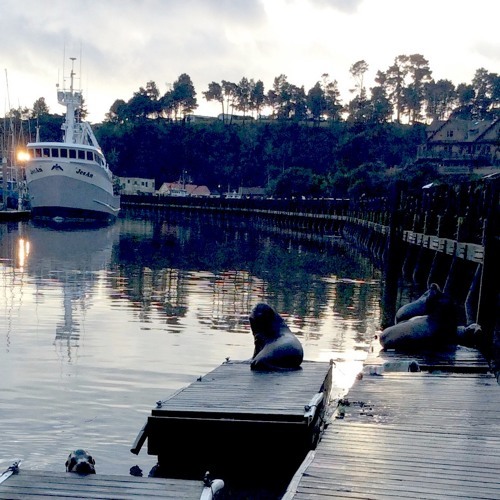 Photo and recordings of California Sea Lions in Noyo Harbor, Fort Bragg, CA, by John Gilmore. Love this asymmetrical rhythmic pattern and the atmosphere through whole track. @hanutmunson Thanks and good call on their meter! dancing in the harbor... 5/8 seals?... great jazzy soundscape! Thanks, Wil. I felt lucky to find such a hip match for the critters' preference for meter in 5. @johngilmorejazz: Yes, I read your description of your track, John. I meant the way you made use of it. Interesting sounds! Love the track! Great track! Love these beasties, the coast is one of the few things we miss having moved away from California. @piraat_davis: Thanks so much, and for officially "liking" the piece as well. @jwiedenfeld: Thanks so much, Jeff, and glad to have discovered your music and kindred spirit so nearby (at least for this corner of the world).